When the Going Geothermal series concluded, I promised to return to evaluate the air conditioning component of our system. With several heatwaves this summer, we had ample opportunities to put it to the test. 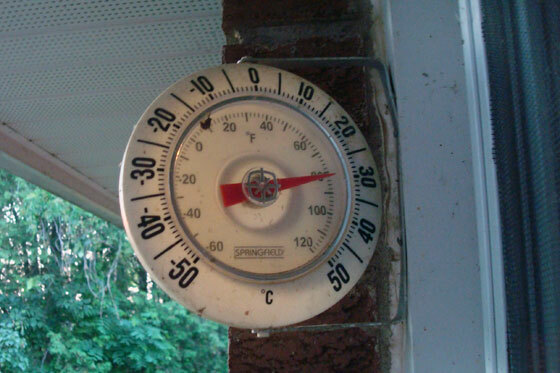 When the temperature is still 28ºC at sunset, you know it’s hot. And with the humidity it felt at least 10 degrees hotter. 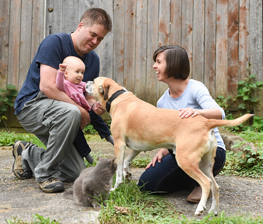 At the start of the summer, the geothermal heat pump had been off for several months as we hadn’t needed heat or cooling. 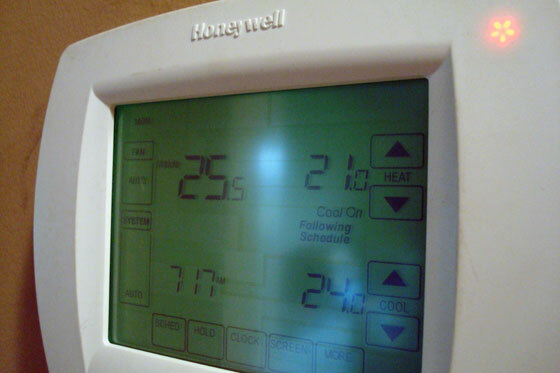 To power it up, we simply chose our set point (24ºC) and turned the thermostat to cool. Within a couple of minutes, the heat pump came to life and cool air was flowing out of the vents. “Cool On” is what we’re looking for. Everything was working well and we were enjoying the comfort air conditioning brings, especially after not having it for the past five years when we were living in our previous house. However, a few weeks in, things changed. 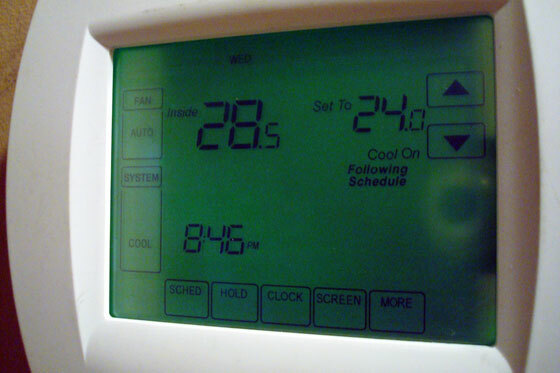 A red light showed up on the thermostat a few minutes after we turned on the a/c one night. I don’t know about you, but warning lights cause anxiety for me. Is this just a reminder that I have to clean the filter? Or is it a sign of real danger? Neither our manual nor Google were helpful in providing the answer. With all of the dust in the house from the renovations, we knew we had to pay attention to the filter, so we gave it a good clean. No luck. The red light still glowed ominously. We shut down the whole system and turned it back on–technical, I know, but it works sometimes. Not this time. With no solution in sight, we turned to the experts and called our geothermal installers for a service call. It turned out that condensation was building up in the heat pump and wasn’t draining properly. Water + electricty = not a good idea, so the heat pump lit up the warning light. 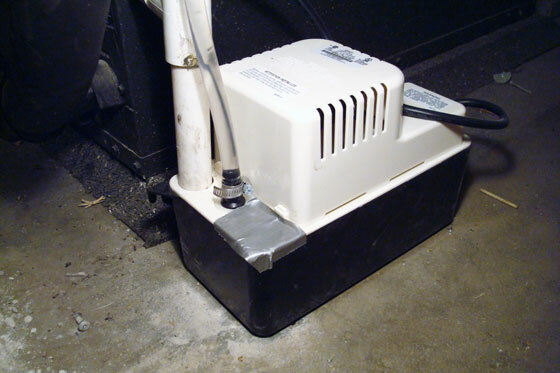 The solution to the condensation was a special pump to remove the water from the system. Our new little condensation pump. The duct tape on the corner is covering a little opening that didn’t have a cap. The pump sits on the floor beside the heat pump. It feeds the water into the clear tube at the front of the unit and then the tube runs across the utility room to a drain. Since the installation of the condensation pump, the geothermal system has been working perfectly. When we’re running the air conditioning, the temperature of the air is very comfortable–not frigid but it cools the house very quickly. As with the heat setting, I definitely hear the air as it circulates through the ducts and vents. The air conditioning is not excessively noisy, but it is noticeable. We are extremely pleased with all of the features of our geothermal system and are happy we made the choice to go geo. It sounds like an awesome system. I also get anxiety with warning lights. Good thing the problem turned out to be fixable.